Well, I have to say I am THRILLED about this. I was very happy with the cover we launched with last year, but this new cover is just gorgeous. The publishers have obviously done a bit of focus-grouping/opinion polling and decided The Seventh Season would benefit from being slightly rebranded, and I just love everything they’ve done with the 2014 edition. On the one hand, I know that Kit would love it because the image they have used is from a painting by Lawrence Alma-Tadema. I was talking to my cousin Amy about the new design, and she said Kit loved Tadema’s work, even though he knew he wasn’t meant to (apparently it is a bit too romantic for historical accuracy purists). 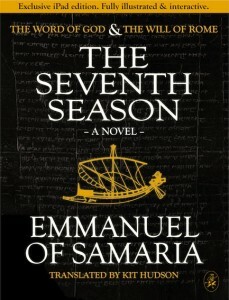 On the other hand, I think he would feel fraudulent that Emmanuel of Samaria’s name no longer appears on the cover. But I feel sure that, if he was persuaded that the change would encourage more people to read Emmanuel/Johanan’s story, he would come round to the idea. Eventually. Of course, for me, it means overhauling the website. I shall be busy over the next few weeks creating new images and trying to make it look as lovely as the new cover. What is the name of the boat on which Johanan and Dido meet? *Please note this version can ONLY be viewed on an iPad or iPad Mini. 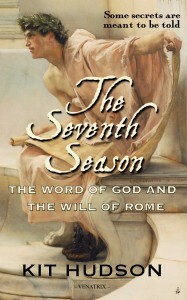 I am absolutely thrilled that the publishers will be bringing out an illustrated and interactive edition of The Seventh Season in the new year. I’ve just got my hands on a copy andI have to say it is absolutely gorgeous. It features lots of interactive, annotated maps and background panels on many of the characters. It really feels to me like the perfect version of Kit’s work. Sadly, it’s only going to be available for the iPad for the foreseeable future, but if you have one of those gorgeous Apple devices, and you want to know more about the world of The Seventh Season, then this might be for you. It’s not been confirmed, but it looks like it will go on sale for $4.99, which seems like quite a bargain to me given all its lush and lavish content. I’ll let everyone on the mailing list know as soon as it becomes available, and I hope to have a few copies to giveaway in the run up to Christmas. WARNING: If you’ve not got to the end of The Seventh Season, you might think this video contains spoilers! Here’s another video from my trip to Greece. It’s a bit dark, but we were so relieved to be sitting in some shade that we didn’t really consider the crime against cinematography we were about to commit! The Altis is the holy grove, the sacred sanctuary, on which the temples and stadia were built at Olympia. It’s a truly beautiful and romantic place and I was surprised how familiar it felt. When you consider that for five hundred years the entire site was lost under several feet of mud (and there were archaeologists on site still excavating parts of the gymnasium and – I’m guessing from looking at a map – something near where we think the hippodrome was), it feels serene and genuinely sacred. Except – as you’ll see (and hear) – when the coach parties turn up! WARNING: THIS POST AND VIDEO ALMOST CERTAINLY CONTAIN SPOILERS!!! Things have been a little quiet on the blog front lately for a number of reasons, but mostly because I’ve been on holiday. I had to visit Greece to tie up some of Kit’s affairs and while I was there I took a wee side trip to Olympia where, of course, The Seventh Season reaches its thrilling denouement. The Sanctuary of Olympia is one of the most beautiful places I have ever visited and it is viscerally and immediately apparent why the ancients held it to be holy. Here is the first of several videos I made while I was there.